Taking care of your lawn can be a daunting ordeal without the proper equipment. Sprinklers make lawn maintenance much easier by ensuring that your lawn stays well hydrated and cool. Many homeowners find that adding a sprinkler to their home maintenance routine makes a considerable difference in the overall health and appearance of their lawn. However, finding the right sprinkler for your needs can be overwhelming. We reviewed dozens of sprinklers to identify the best of the best. Since sprinklers come in many forms, we looked at a wide range of features. These include coverage range, spray type, best uses, efficiency, and special features to name a few. That way, we can show you which models can fit your needs the best. Our top pick, the Nelson Traveling Sprinkler RainTrain, embodies the best of all of the features that we looked for. It gives you the ability to water your entire lawn with its extended range, but provides exceptional coverage throughout. It is easy setup and use as well. Plus, it has the added benefit of being highly entertaining and a conversation starter with your neighbors. The Nelson Traveling Sprinkler RainTrain is our top pick. Unlike most other sprinklers, this one sprinkler has the ability to water your entire lawn. In some cases, it can even water your front and back yards without any manual assistance on your part. That is because it travels under its own power using the pressure from the water hose to move forward. 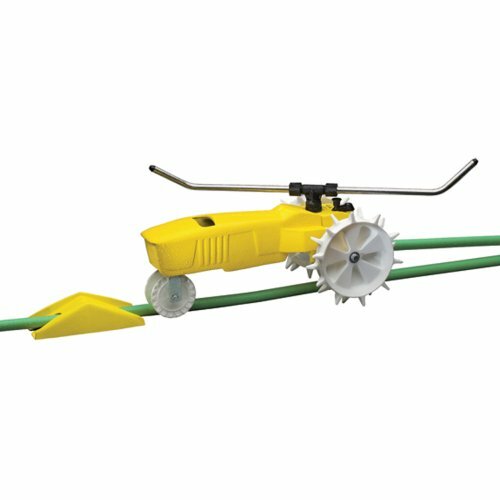 The Nelson 818653-1001 Traveling Sprinkler RainTrain is highly durable. It is made out of cast-iron, which is resistant to dents, scratches, and other forms of damage. A yellow powder-coated finish makes it rust and weatherproof. Large spiked wheels make it easy for the Nelson 818653-1001 to travel on nearly any type of terrain. The best feature of the Nelson 818653-1001 is its range. Since it travels, it can water an area of up to 13,500 square feet. Overall, it can move a total of 200 feet while watering every part of your lawn along the way. The Rain Bird 25PJDAC Brass Impact Sprinkler is our runner up pick. Many people prefer the experience of using an impact sprinkler because of its traditional design. It makes a clicking sound as it uses a swinging hammer to turn the spray head. It is a great option if you enjoy a more traditional approach to sprinklers. The best part of the Rain Bird 25PJDAC Brass Impact Sprinkler is its construction. It is made out of brass, bronze, and stainless steel. Because of this, it is highly durable and rust-resistant. You can have the same sprinkler for a long time without experiencing performance problems. The Kadaon Garden Sprinkler, 360° Rotating Lawn Sprinkler is our best budget pick. It is one of the most affordable options on this list at just $9. That makes it easy to acquire and replace if needed. The Kadaon Garden Sprinkler, 360° Rotating Lawn Sprinkler features a rotating head with three arms. Each arm has three nozzles for exceptional water coverage. The taller design makes this sprinkler useful for covering tall plants. One of the best features of the Kadaon Garden Sprinkler, 360° Rotating Lawn Sprinkler is its expandability. While a single sprinkler gives you effective coverage, larger yards may need a system of sprinklers. The Kadaon Garden Sprinkler, 360° Rotating Lawn Sprinkler has an input and output connection so that you can connect multiple sprinklers together to create that system. That way, you can expand your sprinkler system at a very affordable price. The Melnor XT Mini-Turbo Oscillating Sprinkler is our best oscillating lawn sprinkler pick. It takes the traditional design of an oscillating lawn sprinkler and adds many improvements to make it more effective. It is a great option for upgrading from an older oscillating sprinkler. One of the best features of the Melnor XT Mini-Turbo Oscillating Sprinkler is its customizable spray pattern. While it follows the traditional back and forth oscillating pattern, you can customize how it sprays. The integrated controls control the length, width, and amount of water that it sprays throughout its path. With customizable controls, the Melnor XT Mini-Turbo Oscillating Sprinkler is an adjustable option that can fit your lawn’s needs. In the rainy seasons, you can turn down the water flow. In drier seasons, you can turn it all the way up. You can also set it to focus on just your lawn so that you are not wasting water. The Orbit 58322 Traveling Sprinkler is our top traveling lawn sprinkler pick. Traveling sprinklers are useful in covering larger lawns with a single sprinkler system. They are self-propelled using water pressure. It has integrated speed controls you can manage how long it covers a specific area along its path. The body of this sprinkler is made of cast-iron so that it is incredibly tough. Although cast-iron is prone to rusting, this sprinkler’s powder-coated paint job keeps it from rusting under prolonged use. A set of large spiked wheels also make it easy for the Orbit 58322 Traveling Sprinkler to cover rough terrain. A pair of long sprayer nozzles offer a high flow rate that can quickly cover an entire area with the appropriate amount of water. Based on its movement speed, you can set it to add more water or less water to an area based on your lawn’s needs. One of this sprinkler’s best features is its ability to travel. Since it can move, it can cover more space than any other type of sprinkler system. It follows the path of your hose so that it can stay on track and follow an easily defined path. That way, you know it will cover the spaces that you need while staying within a defined space. When used effectively, this sprinkler can effectively replace an entire sprinkler system. Anyone that wants to have a healthy, lush, green lawn should get lawn sprinklers. In most cases, unhealthy lawns are caused by poor hydration. Even in wet areas, grass can be dried out by the wind and sun. A sprinkler system can solve this problem quickly. The key to using a sprinkler system is to provide effective coverage for the area that needs continued watering. There are many types of sprinklers to choose from. Some models are tall, which are great for watering gardens and over tall plants. Others are smaller and more discrete. However, picking the right one for the job is essential. To keep your new lush, green lawn perfectly manicured, you should also check out our reviews of the best lawn edgers and the best string trimmers. We’ve also covered the best lawn care products in a separate post, as well as the best lawn mowers. Spray type. The method used to spray water in the coverage area. This can be a rotating head, oscillating bar, or other types. Coverage areas. The amount of space that your sprinkler can cover. Construction materials. The materials that the sprinkler is made out of. Regardless of what it is made of, the materials must be water and rust-resistant. Cost. The cost of the sprinkler determines its acquisition costs as well as long-term maintenance costs. Portability. Whether the sprinkler is mobile or permanently installed. PSI. A measure of how much water pressure (pounds per square inch) your sprinkler needs. Residential and commercial systems run on different PSI levels. What is a lawn sprinkler and how does it work? A lawn sprinkler is a device that sprays water over your lawn to keep it hydrated and healthy. In many cases, lawns sprinklers are the key to keeping your lawn healthy. Without proper hydration, grass tends to die quickly. Lawn sprinklers can use a variety of systems to distribute water. Some use a rotating spray head while others use fixed sprayer nozzles on a moving arm. They often collect water from an outdoor faucet used for garden hoses. How many types of sprinkler heads are there? There are many types of sprinkler heads and each type has its own uses. For example, oscillating sprinklers provide a continually sprayed curtain of water that follows a linear path back and forth. They are great for covering large rectangular lawns. There are taller sprinklers on tripods or on pipes that can shoot water up and over tall plants. They make great garden sprinklers or sprinklers for tall grass. Traveling sprinklers are able to cover a much larger area with water since they travel along a determined path while spraying. They are great for large longs. You could also choose a rotating sprinkler the has a spinning head to distribute water evenly across an area. How many gallons per minute does a sprinkler head use? Every sprinkler head uses a different amount of water per minute. Each sprayer type, as well as different manufacturers, design their heads with different specifications in mind. So, comparing sprinklers by their water flow can be difficult. Many sprinkler manufacturers post these details on their spec sheets on their websites. However, there is a general rule of thumb that you can follow. Sprinkler heads that have a high number of nozzles or large waterspouts use more water. These include sprinklers with multiple arms that spray at a really high speed. However, some sprayers may use less water depending on their flow rate and nozzle size. If a sprayer has a nozzle with a wide opening, it is likely to use more water as well since more water can escape at the same time. How many sprinklers can I put on a zone? The number of sprinklers that you can use depends on the size of your space and which type you choose. A traveling sprinkler often only needs one unit to be effective since it travels the length of the space. Oscillating sprinklers also don’t need large unit numbers to be effective. Smaller sprayers like rotary sprinklers can have multiple units in an area to provide more coverage. In many cases, these units chain together using a main hose and a series of connector hoses. That way, you can use multiple units of the same sprinkler to cover an area. However, there is a limit to how many units that can be connected. Each one lowers the water pressure to the next unit, and the resulting decrease means that you can only have so many before the last one doesn’t work well. Typically, homeowners connect up to three sprinklers together at most. We looked at 20 lawn sprinklers. Even though they didn’t make our 5 best lawn sprinklers list, they’re the best of the rest and each is still a great option for your lawn. The information you’ll need to compare each one is included with the listing. 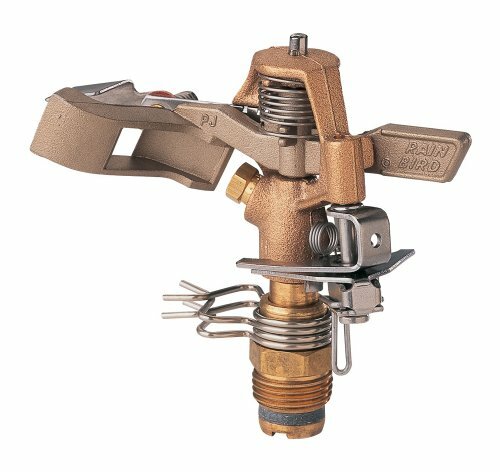 This DALYA IRRIGATION Yuzuak ATOM28 1.5″ Female Thread – Impact Sprinkler works best in commercial or industrial situations thanks to its sturdy construction and high output. It is designed to run on a high-pressure water input often used in commercial uses as well. The nozzle and arm are designed to give you a smooth rotating action even though the pressure is much higher than residential pressures. Plus, it can be portable for easy positioning and relocation. The Melnor Impact Lawn Sprinkler is designed for efficient home use. A wide sled-style base makes it highly-stable while rotating 20-360 degrees. The base is made of a dense metal so that it is rust-resistant and weatherproof. The head is made of brass for corrosion resistance and added durability. It can reach distances of 40-85 diameters and has an easily adjustable control system. That way, it can effectively water up to 5,600 square feet. This Orbit 62100 Yard Enforcer Motion Activated Sprinkler is not just a lawn sprinkler. It is also a safety deterrent system. It has a motion sensor in it that lets it detect approaching people and animals. When they are in range, it turns on and rapidly spins to provide a wide coverage if intense water. It also has a day and night sensor so that it works at any time of day, and can be used to water your lawn when you want to. The Orbit Heavy Duty Brass Lawn Impact Sprinkler on Tripod Base is a smart choice for irrigating large areas with tall plants. The tripod base helps the sprinkler shoot over taller plants and maintain a wide area of coverage. The base is made out of sturdy materials and can be anchored to the ground if needed. The tripod also collapses to make it easy to transport. The Rain Bird P5RLSP Plastic Impact Sprinkler on Large Metal Spike is a great option if you are watering a large square area. You can put it in a corner and cover much of the area. Or you can place it in the center to take advantage of the full 360-degree coverage. It is mounted on a large metal spike for added stability and durability. The adjustable nozzle can cover as little as 21 feet and as far as 41 feet. If you need to cover a small area with strange dimensions, then check out the GARDENA ZoomMaxx Oscillating Sprinkler on Weighted Sled Base. 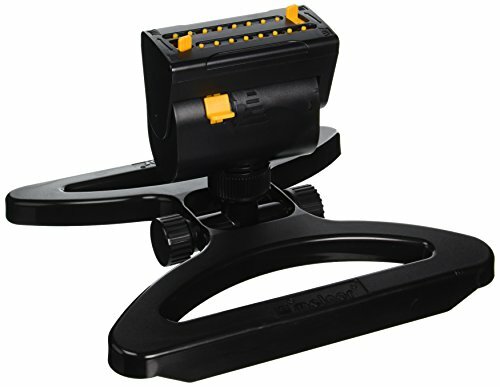 It has a fully adjustable system that lets you change the angle, width, and length of the coverage area. You can also adjust the water flow to use less water if you need to. Inside the base of the sprayer head is a small water filter to help keep heavy minerals out of your sprinkler. The head has 16 nozzles made out of a flexible material so that they can withstand the pressure of the water over time. This sprinkler has a very compact size so that it can fit nearly anywhere. This Melnor XT Metal Oscillating Lawn Sprinkler is designed to give you complete coverage with adjustable controls. It is mostly made of aluminum, making it lightweight and durable. The integrated zoom control allows you to quickly adjust the overall coverage area. On the end, there is an end cap that you can remove to clean the insides of the nozzles. There is also a water input filter to help prevent nozzle clogs over time. For a simple but useful sprinkler, try the Rainwave RW-93000 Turbo Gear Oscillating Sprinkler. It has very simple controls so that it is easy to use. Plus, the base is made out of highly durable plastic, making it corrosion-proof. The nozzles are made of brass so that they avoid clogging and corrosion over time. There are 18 nozzles that provide a full arc of coverage across the watering area. The Sun Joe SJI-OMS16 Indestructible Metal Base Oscillating Sprinkler with Adjustable Spray is an effective choice for covering wide open areas. It has an adjustable coverage area with long arching water jets. The metal base and components are practically indestructible under normal use. There are 16 clog-resistant nozzles that prevent the need for constant cleaning. The hose connection is designed to prevent water waste from leaks as well. FITMAKER Lawn Sprinkler, 360 Degree Rotating Sprinkler offers an unusual design for a sprinkler with a 360-degree rotating head. The butterfly sled-style base makes it more stable while having minimal contact with the grass. The air pressure created from the rotating head also helps create downward pressure to keep the sprinkler firmly planted on the ground. It is made out of ABS plastic so that it is durable. The Garden Sprinkler, 360° Rotating Adjustable Lawn Sprinkler Irrigation System with Leak Free Design gives you a range of use options thanks to its design. It has adjustable heads that turn up to 45-degrees so that you can change the angle of the head. It is made out of heavy duty materials as well including brass nozzles and sprayer heads. This sprayer design is useful for lawns, but can also be used for gardening. If you have a greenhouse, you can use it for cooling the air inside as needed. You can try this GREEN MOUNT Lawn Sprinkler to water your garden effectively. It comes with two interchangeable heads so that you can get different spray types. One head uses the standard contact sprayer design that rotates manually. The other head has two large arms and is useful for gardens and large plants. It also has wheels that make it easier to change positions as needed. All of the key components are made of durable metals that can withstand constant use. 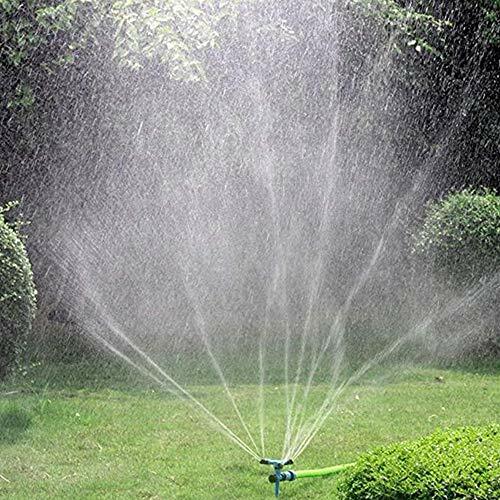 A GrowGreen Garden Sprinkler, 360 Degree Rotating Lawn Sprinkler is ideal for gardening as it can cover a moderate area with enough water for garden plants. With a full 360-degree rotation, you may only need one to cover your garden. The overall design is durable and will last you a long time. With simple parts, it is easy to assemble and use. Plus, very little cleaning is needed to keep it working at optimum efficiency. If you need multiple sprinklers, you can chain several of these together with connector hoses to make one complete system. You may want to try the Lawn Sprinkler Automatic Sprinklers For Garden Water Sprinklers For Lawns 360 Rotating if you are getting into lawn care. The rotating design gives you superior coverage along with two sprayer types for different purposes. Overall, it is a cost-effective way of improving your lawn. The flow from this sprayer is gentle despite its long distance. That way, you can use it for sensitive plants as well as a child sprinkler. Many people like to use it in their garden on sensitive plants like tomatoes or roses. This Lawn Sprinkler, Automatic 360 Rotating Adjustable Sprinklers for Garden works well for any lawn care need. Its rotating head extends coverage in every direction, limiting the number of sprinklers that you need. Plus, it comes with a butterfly rotating sprinkler for different uses. There is also a quick disconnect converter for hoses and other input devices. That way, you can pair this sprinkler to nearly any hose. This Milemont Garden 360 Degree Rotating Lawn Sprinkler makes it easy to cover your entire lawn. Not only does it reach 32.8 square feet, but you can also chain several of them together. That way, you can reach your entire lawn without the need for hose splitters or additional water sources. This sprinkler is versatile in the types of plants that it can water. It is useful for lawns because of its wide coverage area, but is also appropriate for gardens since it can reach over taller plants. You can also use it to keep trees watered and cool since it can reach high up into their branches to cool the leaves. This Signature Garden Lawn Degree Rotation Can be an effective way to water your lawn. It has 12 nozzles with a full 360-degrees of coverage. That way, it can reach a large coverage area with a tall spray arch to reach over taller plants. A traveling sprinkler can be more effective at giving you full lawn coverage. This Melnor 4501 Traveling Sprinkler moves across your lawn and covers every area. You only need the one sprinkler, and you can change the path as needed for better coverage. This Nelson 1865 Rain Train Cast Iron Traveling Lawn Sprinkler Tractor provides extensive coverage with just a single sprinkler. The cast-iron body is highly resilient to damage and wear, while also being rust-proof thanks to an outer coating. It moves at 21 feet per hour and can cover a large area in a day. The Watex WX044 Traveling Sprinkler is a customer favorite for its looks and performance. It has a tractor theme that is fun and appealing. The design is ideal for large lawns and spaces to cover. It can also handle water pressure up to 120 PSI.